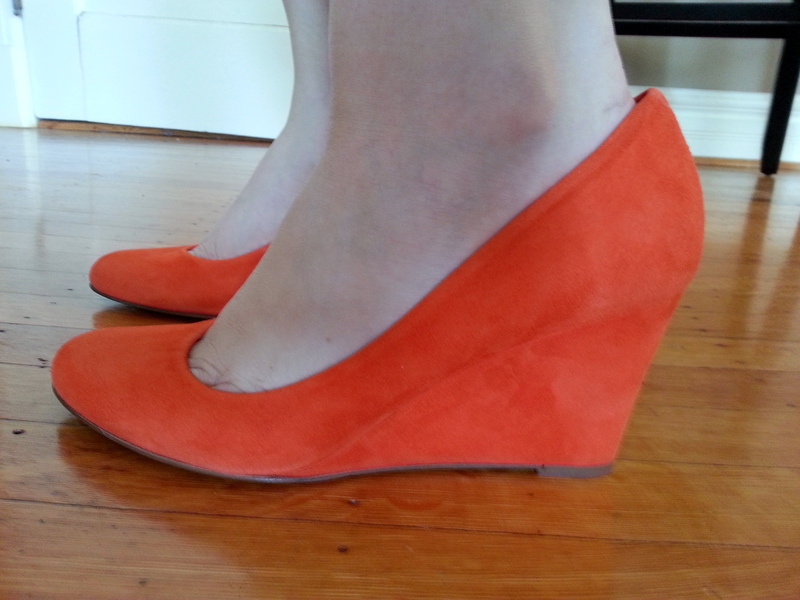 In an effort to build my collection of non-black shoes, I ordered the J.Crew Martina suede wedges in bright pomegranate during a recent 30% off sale promotion. 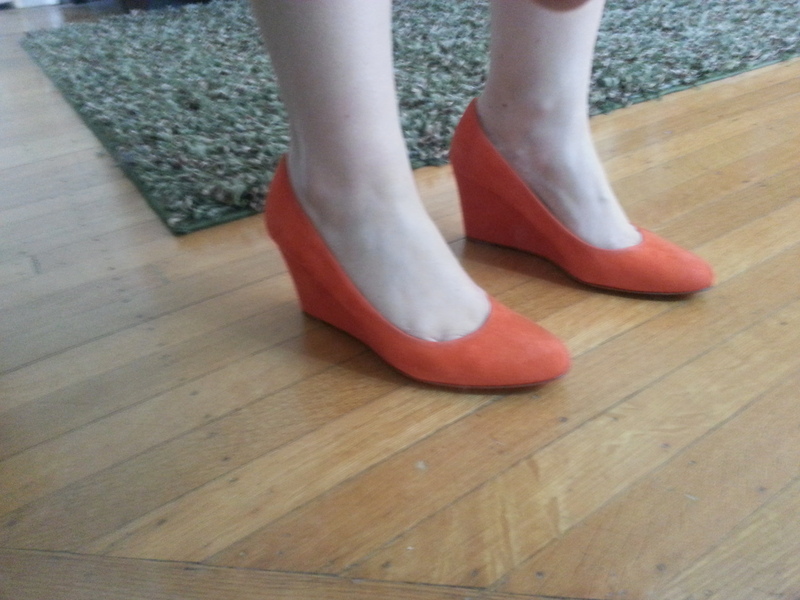 I don’t own any pairs of orange shoes and something about these shoes were attractive to me. I also don’t own a lot of wedges. I think I’ve often found my legs look funny in them and I prefer the look of regular heels, however, the few pairs of wedges I do own I find to be very comfortable. 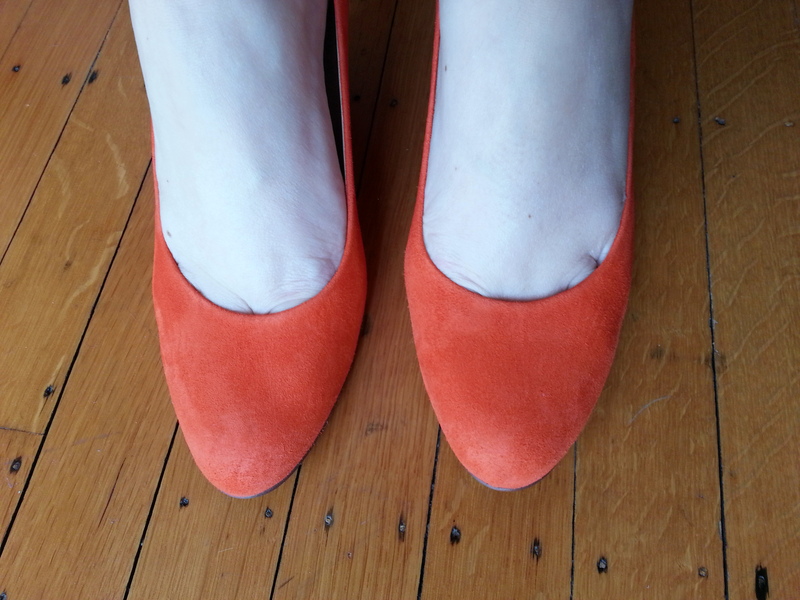 The website photo to me read more papaya than pomegranate but after seeing the Cece suede flats on Audreybella’s blog here, I knew I was in for some bright orange shoes. That’s ok though, I can do bright. Well. They arrived last week and straight out of the box it was love at first sight. They fit perfectly, and are oh so comfortable. 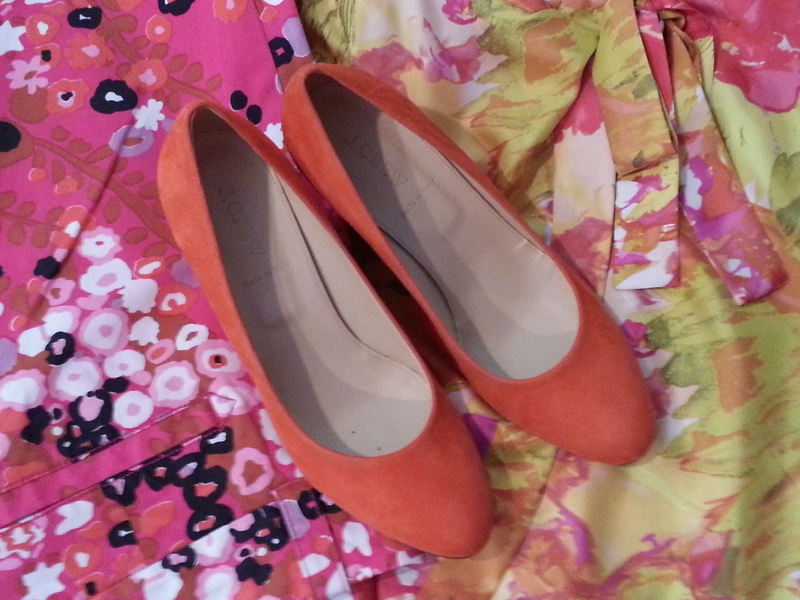 Granted, I haven’t gone a full day in these yet, but my inner fashion voice tells me that these will be comfortable. I went right to the website to look at how many different colors are currently being offered (many still regular price) and I know there is also a patent version which I think need to be on my list (even if they are black). I had a pair of black patent wedges from Nine West that died a pretty quick death so I will not be revisiting those for a replacement pair. Aren’t they pretty? I have to say I’ve never seen a pomegranate this color, and I think perhaps the color-naming gods at J.Crew must have their fruits confused. 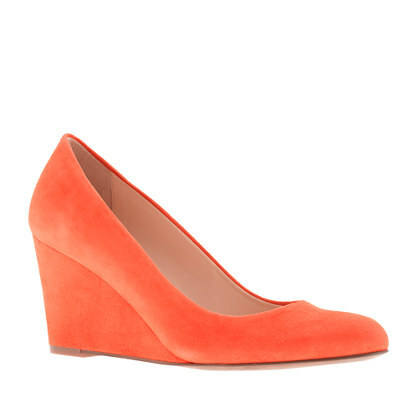 These are definitely tangerine. I was hoping for papaya but they’re really just flat out orange. No toe cleavage as you can see. 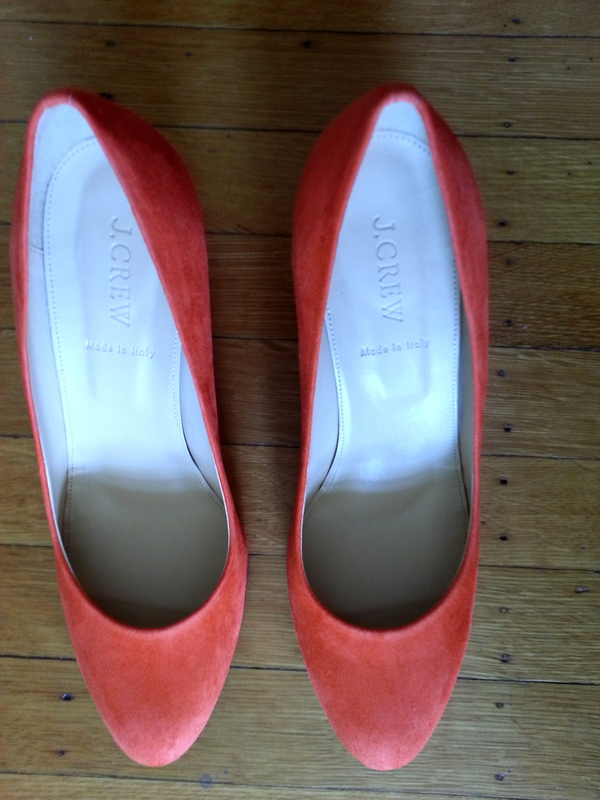 I took my usual 1/2 size up in J.Crew shoes in these (9.5). 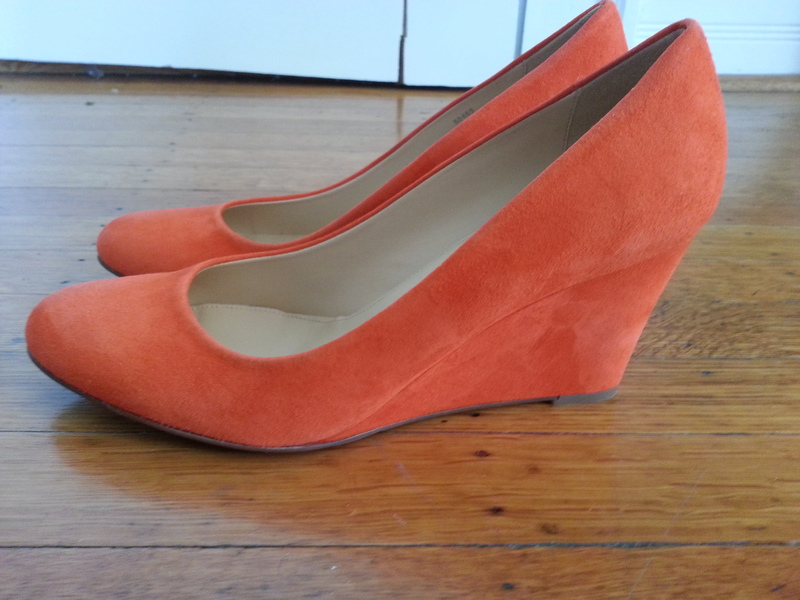 The online product description lists a 3 inch heel. There’s no platform in the toe area, but regardless, they are incredibly comfortable. The product description also lists a cushioned toe-bed which I can totally buy. 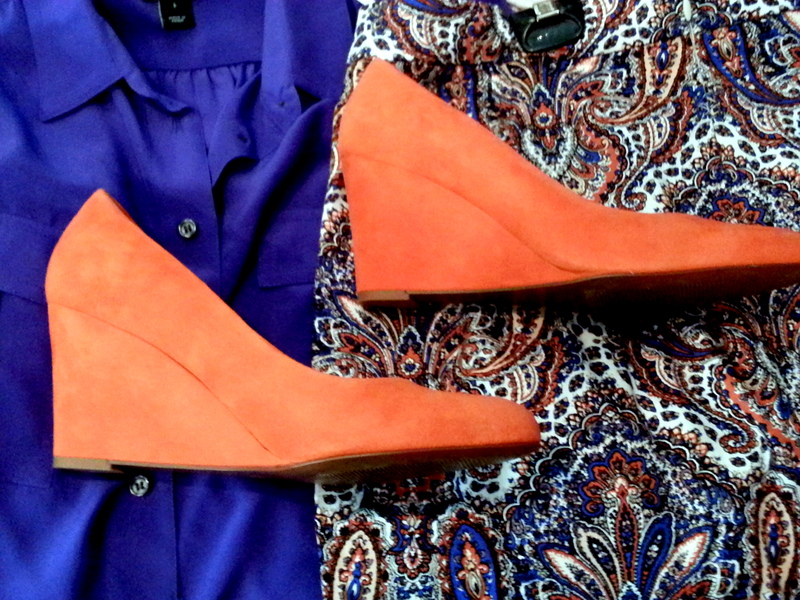 I’m obviously not wearing the cherry blossom capris and the waterfloral tank together, but I was glad to see I have a few other bright options for the shoes other than basic navy. I will certainly be planning several outfits around these shoes soon, as soon as I make sure they’re safely protected from the elements. So, what do you think? Do you have these shoes? Love them or not so much? Would love to hear what you think and thanks for visiting! They’re very striking w/the black/white. I love how the colors from different seasons intermingle. Looks very pretty with the prints, too. I loooooove the Martinas. I can literally walk all day in them. 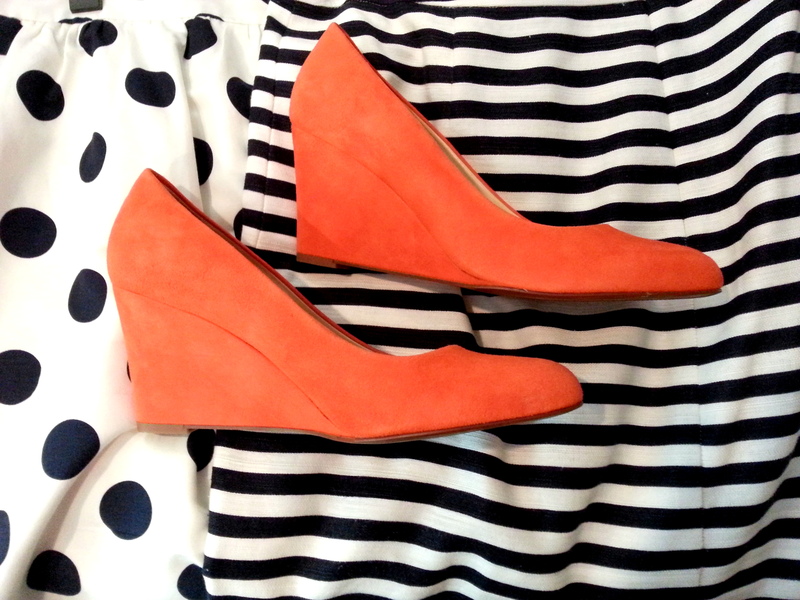 Yes, I always feel good when I can pair my older J.Crew items with newer ones. I definitely need these in another color. I’d love a dark grey or something. I wish I had tuned in to these shoes sooner since of course I’m loving some of the older colors! I should probably get some outfits planned with these first though 🙂 Thanks for taking the time to comment!